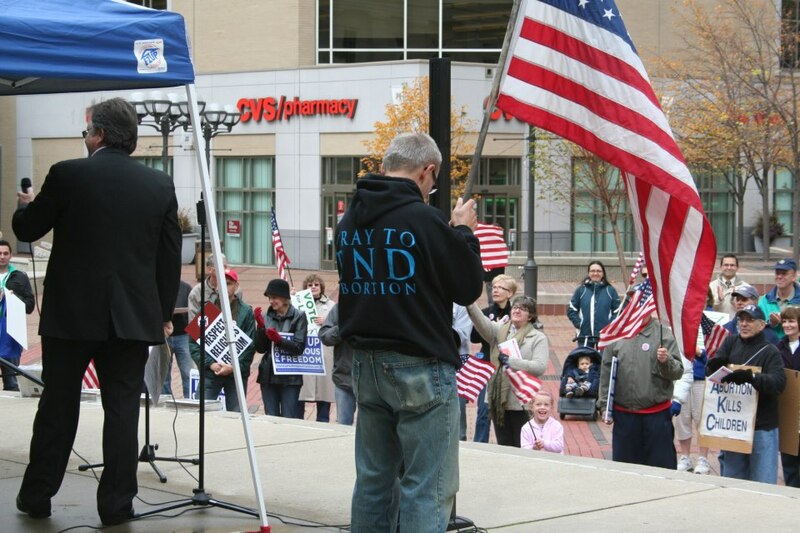 VOTE for LIFE & LIBERTY, not agenda; and it starts at the local level. This is an 8th grade little girl that has an assignment on STD’s in public school. This reproductive justice agenda and abortion agenda in public schools are funded by TAX PAYERS….TAX PAYERS! The National Education Association is the largest union in the U.S. and one of the most powerful political forces in the nation. Left-leaning recipients of teachers’ forced dues include some of the following organizations: ACORN, NAACP, Human Rights Campaign, RainbowPUSH Coalition, and National Partnership for Women & Families which supports the abortion agenda and the reproductive justice agenda and judicial bypass for juveniles for abortions without a parent’s permission. The National Education Association [NEA] is IN YOUR PUBLIC SCHOOLS….WHICH YOU PAY FOR…..AS A TAXPAYER….WHO VOTES. Find Issue 11 endorsements here; you’ll see a host of liberal Democrats and agendas there. But remember, you won’t know who or what will be funded until AFTER THE ELECTION. As a voter you should be INCENSED by the blatant assumption that your needs will be met; remember, their recipient Planned Parenthood kills unborn children. And interestingly, a photo on Issue 11’s site shows a child with Down Syndrome…a person that Issue 11 would help. BUT for that one child, abortion murdered 9 others: 92% of unborn babies diagnosed with Down Syndrome are aborted. 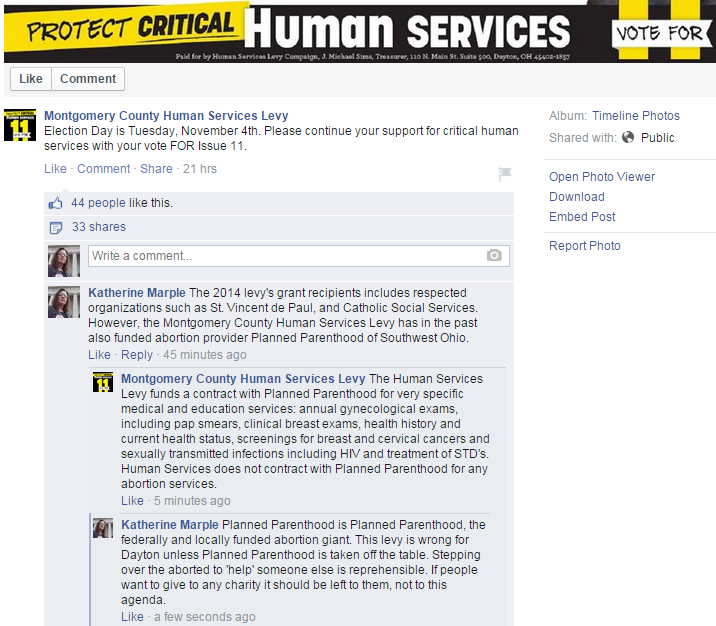 Issue 11, the Montgomery County Human Services Levy, has funded Planned Parenthood TWICE. INTERESTING SIDE NOTE: The Facebook page for Issue 11 deleted our comments and disabled the ability TO comment. See the screen shot below. In ittly bitty Dayton, Ohio this is happening with Issue 11 and in Montgomery County alone, there are 20 TAX LEVIES on the 2014 November Ballot. Some of these levies actually have the guts to say “ZERO Increase in Taxes” when the reality is your tax will go DOWN when you stop renewing more money to something that isn’t working. Click here to look up your property tax; click here to see how a slipping economy has stricken Dayton and getting taxed to death while getting NOTHING in return but more debt. With an unemployment rate in the city of Dayton as high as 12.4% in the last 5 years, taxing what isn’t there will not a better city make…nor will aborting future taxpayers. Vote for LIFE & LIBERTY!